Re: Stop The Cruel Capture Plans For Orca J50 And No Drugs In The Salmon! US and Canadian agencies still have not ruled out putting drugs in salmon that other orcas would eat because the sick J50 cannot be specifically targeted. That could cause life threatening health problems. And their inhumane capture plans includes “...in a situation where she’d be likely to die anyway.” If that ever happened then Let Her Be! to die in peace with her mom and family! Any proposed capture plans for the orca Scarlett/J50 would be cruel and presents a high risk of harm to her, her mom Slick/J16 and her family. This is the same family that with mom Tahlequah/J35 recently mourned the loss of her baby and carried the lifeless body for 17 days. Separating Scarlett and mom Slick would cause unimaginable suffering. It would break a precious bond between them and their lifelong family. A capture could also result in injuries and drowning. NOAA and DFO must stop these “last resort” cruel capture plans. Even if J50 ever was separated from her family they can reunite on their own or be reunited NOT captured. If stranded on a beach she must be refloated and reunited. (Note: BC Transient “Tumbo”, who suffers from scoliosis, has been separated and found his family). At times Nature will take its peaceful course as one passes on with their family not torn apart from them. On September 3rd J50 appeared to be active by officials. 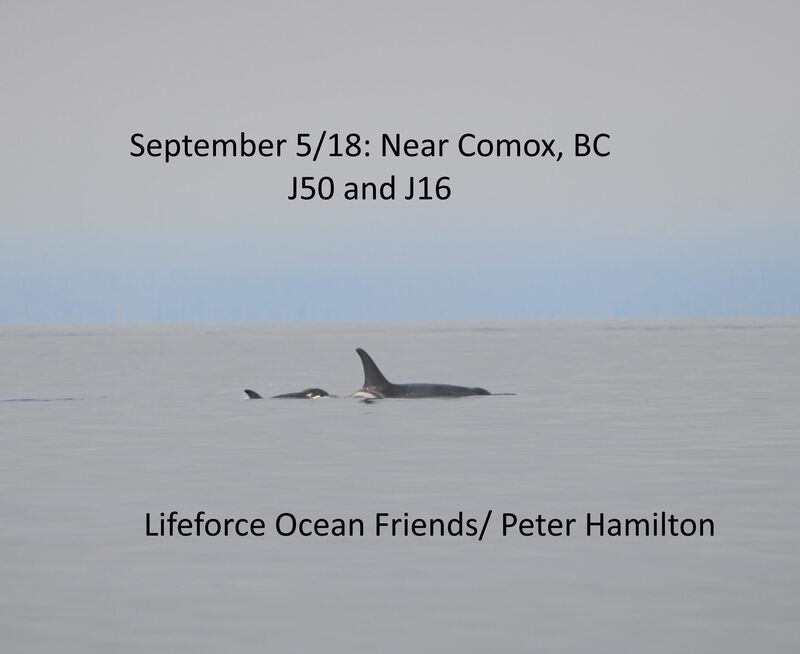 And on September 5th she was quite active when observed by Lifeforce’s Peter Hamilton in waters near Comox, BC. She was later travelling and keeping up with the mom and others. Spread the Word! Spread this Petition! Save the Orca Families Now! More information at Lifeforce Ocean Friends:Lifeforce Ocean Friends.